Virgin Islands News Online (VINO) on December 11, 2018, was first to accurately report on the move, when sources within the PVIM revealed that internal discussions had begun, given their 3 seat majority in the 5 member Opposition of the Virgin Islands’ House of Assembly (HoA). The move was later confirmed by Hon Fahie, on Friday, December 12, 2018, during a press conference, when he revealed that the leader of the PVIM, Hon Skelton had formally told him of their intention to take over the post by writing to the Governor, Augustus J. U. Jaspert to have his position revoked. 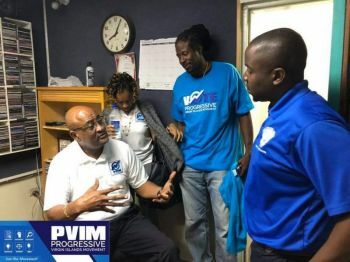 “It was always clear to me that… they [PVIM] were going to come for the position, I had no doubts in my mind,” Hon Fahie told the media at the studios of the Caribbean Broadcast Network (CBN). “This course of action being taken by the new political party members that are now in the Opposition… but were all recently in the NDP Government, is procedurally correct,” Mr Fahie uttered. However, he notes, “What amazes me as a member of the House is that we have so many issues, people need so many help… need leadership at this time… It seems to me everyone in the Government… none of them have taken responsibility for what happened over the last eight years,” he said when questioned about whether the PVIM could handle the Leader of the Opposition post. “While procedurally correct, the question must be asked how credible would a by-product of the very sitting NDP Government, that has caused the pain and suffering of this Territory be in defending the people and opposing the Government as Leader of the Opposition?” the Opposition Leader questioned. “Where will this leadership be headed? Is it to defend the people’s interest or to attempt to hide their very own misgivings?” he further said. “Due to the lack of transparency, accountability and good governance NDP has now mutated, divided themselves in two and hence, make it more difficult for you the people of the Virgin Islands to receive the assistance and representation that you deserve,” Hon Fahie told the press. “I will continue to represent the people of the First District and the people of the entire Virgin Islands,” he said, “because that is my mandate as a Member of Her Majesty’s Loyal Opposition and as an elected official,” Mr Fahie said in his supposed final speech as the Opposition Leader. Ahead of the announcement, ‘Honestly Speaking’ radio host, Mr Claude O. Skelton-Cline had called the move by the PVIM a clear indicator of ‘power-grabbing’, “elected officials who seem to be just about their business rather than the people’s business,” he said. Fahie I were for you but every day in the media complaining without solution have me thinking. Now is a good time to work together and make this thing work. Ronnie has first hand information and you are a good fighter. With both of you on the opposition make the BVI great again. Common sense, Smdh!!! Stop lying. VIP has rolled out many solutions weekly on radio ads and on their VIP radio shows. You have to live under a rock or is just a Fahie hater. You only read when Fahie is raising concerns that the public needs to know but you seem to miss the many articles where the same Fahie list solutions. Some of you are just unbelievable. Fahie you and ronnie is one any blind man can see that, but at the end of the day-walwyn will be the next premier! Wall-win cannot be Premier from the jail. Talk the truth and stop trying to paint Fraser as the victim and Fahie as the bad guy. Fraser was Chairman of the VIP which allowed him to be the Leader of the Opposition. When Fraser lost the Chairmanship of the party then he lost the Leader of the Opposition. So Fahie didn't take anything from him. Fahie that should be your least worry. Just know myself and the majority of the BVI is for you then Ronnie/PVIM & Myron/NDP..
Whoever said Myron was gonna be premier in that comment above is so delusional I was for Myron not to long ago until the wall problem and him not keeping it real with the people and then have the nerves to call out the governor.. I’ve noticed he’s a very rude bully. Ronnie out of the picture for sure. Never supported Andrew but seeing how he build back the VIP with strong intelligent people who love the country and not power hungry like PVIM I respect him & his grind and involvement in the youths... Me & my family is Voting for Carnel Clyde in second district (our district) and the 4 VIP atlarge team ALL THE WAYY!!!!! What did you expect. of the 5 people, at least 4 want him to be LOO. Why should he disappoint those people who have the confidence in him? Fahie of all people understands that as he took it in less desirable circumstances. It is the LAW. When it was in your favor you had the position. Now that the law is in Skelton’s favor, you have a problem, isn’t that how you got it from Fraser, you were happy. Stop the nonsense. No NDP or former NDP need to be running for office.